Good music, good beers and arguably the best burgers in London cooked up by Lucky Chip. 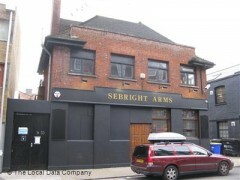 Brought back from extinction, the Sebright Arms is more popular than ever. The hackney Road pub is secreted down a narrow alleyway but find your way there and you can enjoy the delights of craft beer, Lucky Chip’s gourmet burgers and an eclectic live music line-up. With a seemingly permanent residence at the Sebright Arm on Hackney Road, Lucky Chip has built up an army of fans. Its salt encrusted burgers are richly delicious, juicy hunks of aged steak. With an irreverent approach to naming (Tom Selleck, Kelly LeBrock etc) the brioche buns and multiple fillings seem even more appealing. Gourmet burgers have moved beyond junk food status into a category of their own. With a permanent residency at the Sebright Arms, Lucky Chip offers some of the finest burgers in London. Starting at £7.00 and going up, the patties with the kooky film inspired names trump most three-course set menus that you can show us. "Good music, good beers and arguably the best burgers in London cooked up by Lucky Chip. " Having sailed close to the brink of oblivion, the Sebright Arms is back with a host of London beers and a new menu. Located at the end of a narrow alley just off Hackney Road, this classic east end pub has existed here in some form or another for over a hundred years. Once it was the shady ‘smoking room’ downstairs that was the only thing worth getting excited about, but since the Sebright Arms is under new owners, grimy basements are out. On entering, the first thing you’ll notice if you’ve visited in the past, is that on first glance not a great deal has changed. The trimmings of tradition are still evident in a conscious attempt to conserve its rich history and it retains the carpet that always kept it cosy. Where once there was a dance floor there are now tables and judging by the newfound popularity of the pub, that’s a good thing. Serving excellent roasts on Sundays and with the Lucky Chip pop up burger shop in the kitchen for a limited time, tables are always at a premium. If there’s one miniscule complaint to be made about the venue then it’s the music on this occasion. Where once DJs played riotous sets of mismatched classics and obscurities, things seem a touch more tame on the ground floor – maybe that’s the order of the night though. Perhaps the hell-raising has decamped to the basement – the seedy smoke den having been reclaimed for some excellent live music and events. Evidently, the pub has cultivated a strong community spirit by bagging Lucky Chip and the same can be witnessed at the bar. A who’s who of London brewing supplies the pumps. Meantime, Brew Dog and Redemption provide the goodness for what is a cut above your average local.